Produced in two minor variations before and after WWII. I believe this one to be pre-war. Three 1/8" or four 3/32" cogs screw onto the threaded flange. Solid axle, steel wing nuts. Steel barrel with integral flanges (not pressed-on). 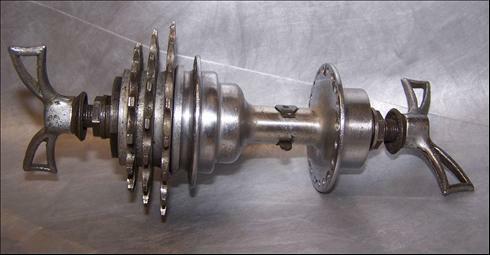 Precursor of Shimano (and other) freehubs. A company primarly focused on the production of bicycle components, hubs in particular. They were forward thinkers of the time, producing some of the first "cassette" hubs as early as the late 1930's and sold it through the mid 50's. This, still 3 decades before SunTour or Shimano attempted to poplarize the same concept. The company also produced freewheels to round out its drive train product line.